Megan K. Pinion, a schoolteacher from Louisiana was shocked when she was served her two orders coffee at her local Starbucks with an “appalling” garnish – a caramel drizzle of allegedly two Satanic symbols, the numbers 666 and one that seems to be Lucifer’s pentagram. 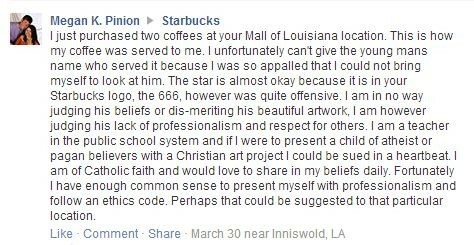 Pinion immediately posted a photo of her Satanized coffee on Starbuck’s official Facebook page, and the coffee giant has since apologized in behalf of their employee. In an interview, Pinion said that she is not in any way judging anyone’s religious preference, but she is quite disappointed with the barista’s lack of professionalism and respect for others. Tom Kuhn, a Starbucks spokesman later reiterated on an interview that they take each and every complaint in relation to their products and services seriously. He refused to comment though on what kind of disciplinary action (or if there are any) that is being served to that particular employee at their Mall of Louisiana branch. Starbucks has long been known to take full responsibility and swift action when it comes to customer service related incidents in the past, including a public apology made to an Army veteran who was stopped by an employee when he tried to get in the Houston Starbucks shop with a service dog and of a 2009 incident where a franchisee on the New Jersey Turnpike refused to acknowledge a customer’s 10 percent discount via the store’s rewards card.